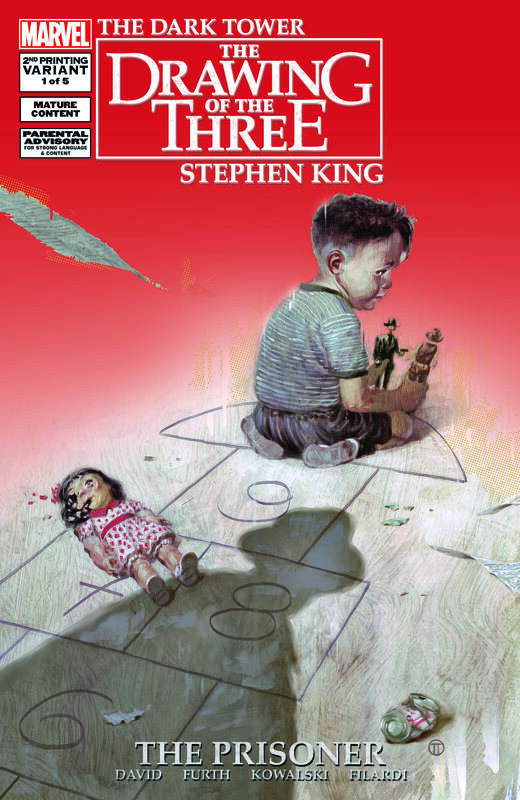 STEPHEN KING’S THE DARK TOWER: THE DRAWING OF THE THREE – THE PRISONER #1 Returns for a Second Printing! Critics and fans agree, the next chapter in Stephen King’s fan-favorite epic is a hit. Today, Marvel is proud to announce that THE DARK TOWER: DRAWING OF THE THREE – THE PRISONER #1 has sold out at the distributor level (though copies may still be available at retail level) and will immediately return to press via a second printing! Fans eager to dive into the series now have another chance to visit the word of Stephen King’s dark fantasy magnum opus as New York Times Bestelling writers Peter David & Robin Furth along with the acclaimed duo of artist Piotr Kowalski & colorist Nick Filardi present an all-new spin on King’s tale that will keep even the most die-hard fans guessing! As King’s saga moves into the second volume, The Drawing of the Three, the action shifts from the dusty plains of Mid-World to the mean streets of New York City! Fans will meet Eddie Dean – an innocent child who grows into a troubled young man with a powerful gift: the ability to unlock doors to other realms. But forces conspire against Eddie – and he must overcome his inner demons if he is to rise up and challenge the Man in Black. Witness the story of a man on his path to destiny and the most important journey of his life! Now is your chance to experience the drama, horror and intrigue that could only be brought to you by America’s #1 storyteller. Perfect for new & old readers alike, don’t miss your second chance to experience the thrilling first issue when THE DARK TOWER: DRAWING OF THE THREE – THE PRISONER #1 returns to comic shops on 10/08/14! Marvel Unveils Exclusive Sneak Peek of STEPHEN KING’S THE DARK TOWER: DRAWING OF THE THREE – THE PRISONER #1! DARK TOWER: THE DRAWING OF THE THREE – THE PRISONER is Coming! I would like to purchase this series. Do you sell any from your site? Sorry we don’t. we are just a news site but you can purchase it digitally on Comixology or print copy on Midtown Comics Online Hope this helps! Thanks for commenting!